Note: The message was written in Farsi and the English translation was prepared by the National Spiritual Assembly of the Bahá'ís of the United Kingdom. In a letter dated 29 July 1980 in which it forwarded the English translation to all National Spiritual Assemblies, the Universal House of Justice wrote: "The message includes several quotations from the Writings of Bahá'u'lláh, Abdu'l-Bahá and Shoghi Effendi hitherto untranslated into English. The English texts of these passages, as they appear in the attached translated message, have been checked and approved at the World Center, and may be regarded by the friends as authorized texts." For her obituary see BW18:733–738. See Armstrong, Counsellor Leonora: A Loving Portrait by Kristine Leonard Asuncion. Brief biographical sketch of Counsellor Armstrong, the "Spiritual Mother of South America" . 1981 - 2002 A Persian-language Bahá’í quarterly journal entitled `Andalíb was published from 1981 to 2012 under the auspices of the National Spiritual Assembly of the Bahá’ís of Canada. From issue no. 69, responsibility for the publication was moved to the Association of Bahá’í Studies in Persian (an agency of the National Spiritual Assembly of the Bahá’ís of Canada). Its associated teaching institute was completed for use soon thereafter, going immediately into intensive service. See photo. Hampshire; United Kingdom; Saskatoon; Saskatchewan; Canada Richard St Barbe Baker; Men of the Trees; International Tree Foundation; Environment; In Memoriam; Births and deaths; Cemeteries and graves the first member of the English gentry to join the Bahá’í Faith. 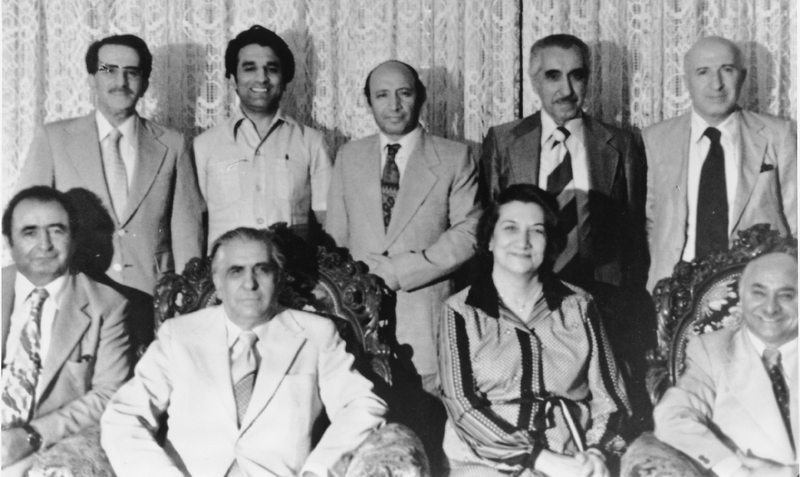 1982 23 Oct Authorities arrested 45 Bahá'ís in Shiraz on the order of the prosecutor. On October 30th another 40 Baha’is were arrested. In all cases, they were arrested simply because of their religious beliefs. Some were later released but many of those arrested were subjected to interrogation and excruciating torture. The interrogations and torture were carried out to extract information about Bahá'í organizations and to force prisoners to renounce their faith and convert to Islam. The oldest among the executed Bahá'ís was Abdolhossein Azadi, 66, and the youngest was Mona Mahmoudinejad, a high school student of 17. 1983 29 Apr - 2 May The Universal House of Justice was elected for the fifth time at the International Convention held in Haifa. For a report of the Convention see BW18:461–4. Since the 1920s when the Bahá'í administration was introduced in Iran they had made considerable progress. 1983 Sep All property and endowments owed by the Bahá'í administration in Iran was seized. For the response of the Bahá’í world to the letter see BW19:112–13. See also Social and Economic Development: The Baha’i Contribution, a paper prepared for the United Nations Department of Public Information Annual Conference of Non-Governmental Organizations (“New Approaches to Development: Building a Just World”) held in New York 5 September, 1984. See also Vick, Social and Economic Development: A Bahá’í Approach. See also Social Action by Office of Social and Economic Development dated 26 November, 2012. See also For the Betterment of the World:The Worldwide Bahá'í Community's Approach to Social and Economic Development by Office of Social and Economic Development. For a report of the Bahá’í participation see BW19:4.12–15. 1985 13 Dec For the first time, the United Nations General Assembly adopted a resolution on the human rights situation in Iran which contained specific references to the Bahá’ís. [BW19:38; VV55] Iran Persecution, Iran; Persecution, Other; Persecution; United Nations; Human rights first resolution on human rights that specifically mentions the situation of the Bahá'ís in Iran. 1986 (In the year) Iran’s hugely unsuccessful attempt to convince the international community that Bahá'ís were indeed spies was probably one of the reasons that convinced Iranian officials to review Iran’s contemporary history. The aim of this review was in no way to reconsider age-old beliefs and assumptions, but to generate so-called “objective” facts and data which would ultimately serve to justify those assumptions. It was in light of this conviction that, the Institute for Cultural Research and Studies was founded "with a mandate to maintain, organize and catalogue valuable historical documents acquired during and after the Islamic Revolution in Iran. In 1996, it was replaced by the Institute for Iranian Contemporary Historical Studies (IICHS), a professional research centre devoted to the study of contemporary Iranian history. Its objective is to undertake various research projects regarding social, political, economic and cultural aspects of post-eighteenth-century Iran, using its collection of primary sources." It was situated in the Chiriqui area of western Panama as part of the Guaymi Educational Centre complex at Soloy. For a description of the Councils and their responsibilities see BW19:162–4. 1986 20 Dec The official opening of Radio Bahá'í Chile in Labranzo, Commune of Temuco.